Baby teeth are an essential part of every child’s oral development. While we know that baby teeth are meant to fall out eventually, most people don’t know when they should expect them to come out. Once they do fall out, you’ll need to know the right steps to taking care of their mouth while the permanent teeth start erupting. To start, your family dentist in Parsippany wants to explain to parents what to do when baby teeth fall out. What Age Should My Child’s Teeth Start Loosening? Children usually begin losing their baby teeth between the ages of 6 and 7. According to the American Dental Association (ADA), the bottom front teeth are the first to fall out. By the time their last tooth falls out, which is usually their second molar, they should be around 12 or 13 years of age. The time it takes the tooth to fall out can vary, depending on how long the root takes to dissolve, as well as how much they wiggle it. Once your child tells you that a tooth is loose, make sure to tell them that this is a normal part of growing up. Inform them that once the tooth falls out, a new tooth will begin growing and take the old tooth’s place. Once the tooth comes out completely, have your child gargle warm water for one minute. This will help rinse out any blood out of their mouth. Use their baby tooth falling out as an opportunity to teach them the importance of daily oral care. While they can keep using their favorite toothpaste, make sure they don’t brush the area where the tooth came out. Brushing the area will make it irritated. According to the ADA, daily oral care consists of brushing twice a day for at least two minutes, flossing once a day, and avoiding cavity-causing foods and beverages like soda and sweets. Make sure your child understands that their permanent teeth need to be cared for daily. 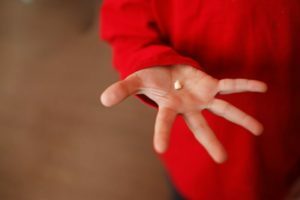 What If a Baby Tooth Falls Out Early? Baby teeth can fall out prematurely due to decay or injuries, but that doesn’t mean you shouldn’t address it. Baby teeth are meant to act as spacers for permanent teeth, meaning your child could face orthodontic issues if a baby tooth falls out too soon. If this happens, contact your dentist in Parsippany. He’ll go over space maintainers, which are dental devices designed to keep space open until permanent teeth erupt. They come in either removable or fixed forms and are usually made of plastic. Even though losing a baby tooth early doesn’t guarantee complications, it’s worth addressing with your dentist. Have more questions about baby teeth? Schedule an appointment with your family dentist in Parsippany to make sure your child’s oral development is on track! Dr. Alan Rauchberg earned his DMD degree from Temple University’s dental school before completing his general residency. His many dental devices can help children if their teeth fall out too soon. To learn more about his practice, contact him through his website.